Update: The hourly numbers in this post are overstated, for reasons I explain in this followup. Uber, the car service which launched as “everyone’s private driver”, and whose entire brand is shot through with privilege and entitlement, is receiving a fair amount of pushback to its driver-income claims. 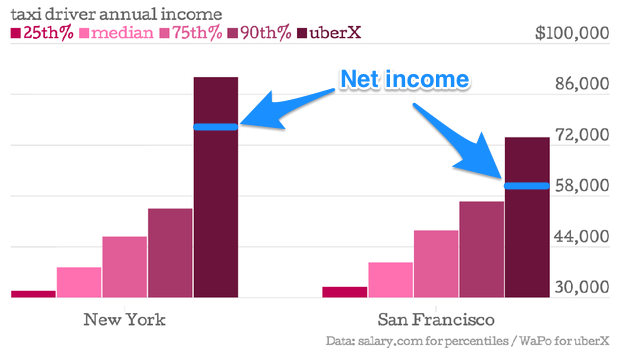 “Do UberX Drivers Really Take Home $90K A Year On Average? Not Exactly” is the headline at Time; similar stories have appeared at Pando and the Atlantic’s Citylab. What we’re seeing here is roughly one third overexuberance on the part of Uber, one third genuine dislike of Uber and its CEO on the part of certain journalists, and one third mutual incomprehension when it comes to the uberX business model. These numbers can only be estimates, of course: every driver and every car is different. But they look like good-faith estimates to me: in San Francisco, for instance, Uber is assuming that its drivers lose $7,763 per year in terms of the reduced value of their vehicle. I don’t think these numbers constitute an attempt to minimize the perceived cost of driving for Uber. If we go with these figures, we end up with net income for a New York uberX driver of $75,686, and net income for a San Francisco uberX driver of $60,014. 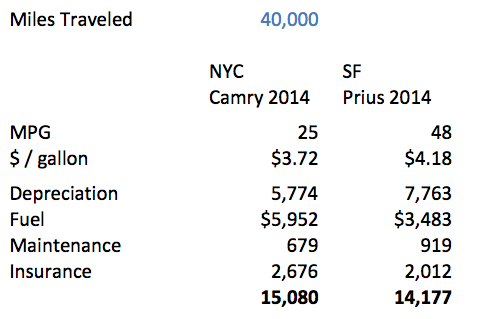 Both of which are still significantly higher than the kind of money cab drivers make in NYC and SF respectively. So while Uber’s claims might be a little bit exaggerated, the main message — that driving an Uber is significantly more attractive, financially, than driving a cab — is I think reasonable and entirely intuitive. But what of these claims by Uber drivers that they are making less than minimum wage? The way I see it, that can actually be seen as a point in Uber’s favor, rather than against them. For instance, let’s take an uberX driver in NYC, who instead of driving 40 hours a week drives just 5 hours a week for Uber. Then the driver’s gross income would be 5/40 of $90,766, which is $11,346. Subtract $5,774 in depreciation, $744 for gas, $679 for maintenance, and $2,676 for insurance, and you end up with net income of just $1,473. Divide that by 260 hours per year, and you get a pathetic $5.67 per hour. Definitely less than minimum wage. But here’s the thing: on top of your $5.67 per hour, you also get, essentially, a free car. So here’s another way of looking at it. Let’s say you’re a New Yorker who has just bought a new Camry, you’re looking for a way to help make ends meet, and you can find five hours a week to work as an uberX driver. In that case, your income from driving will be $11,346, while the marginal cost of doing so is basically just the cost of gas: $744. Looked at this way, your net income is $10,602 for 260 hours’ work: that’s $40.77 per hour. Not so shabby. Companies like Uber and Airbnb turn goods into services: they take resources like cars and housing which are often idle, and monetize them. Most cars spend most of their time just parked, taking up space and performing no useful function. If we could all drive the same number of aggregate miles but with a substantial reduction in the number of cars on the road, that would benefit everybody. That’s the promise of Uber, and Lyft, and even of Zipcar: they’re freeing up space on the streets by making it less necessary for people to own their own rarely-driven vehicles. And at the same time, people who do own their own vehicles can turn them from liabilities into assets. Uber’s private drivers are, well, private. They’re individuals who own their own cars, and who are turning those cars into an income stream. If you want to do that as a full-time job, 40 hours per week, and you live in a city like New York or San Francisco where uberX fares are reasonably high, then you can end up making a surprisingly healthy amount of money. In many ways the more interesting aspect of uberX, however, is that it’s available to people who don’t want to do it full-time. It probably doesn’t make sense to go out and buy or lease a car just to be a part-time uberX driver. But if you have a decent car anyway, uberX is a pretty good way of making a pretty good marginal wage. Alternatively, if you’re getting a new car, uberX can provide a way to justify choosing a nicer one than you might otherwise be willing or able to afford. Uber even provides a good financial reason to keep your car in good clean shape, rather than letting it become a place for random junk to pile up. It’s not for everyone, of course. Being self-employed, in general, is not for everyone. There are lots of reasons why you might prefer to have an employer, even if your employer is a taxi company which doesn’t pay very well. If you’re a recent immigrant with no credit history, for instance, you might not be able to buy your own car. For the time being, though, my feeling is that it’s a bit churlish to look the uberX gift horse in the mouth. Yes, if the median NYC uberX driver makes $90,766 per year, then that means Uber itself is making somewhere north of $22,000 per NYC uberX driver per year. That’s a very nice income stream, and helps to explain Uber’s multi-billion-dollar valuation. But just because Uber is making huge amounts of money from its drivers doesn’t mean that it’s ripping them off. In fact, a lot of them would seem to be making a surprisingly healthy living.